Taseko Mountain, just East of Taseko Lakes, is the ruling summit of the entire South Chilcotin Area. Because of its distance from any road it is seldom visited. Its commanding height is not readily apparent, and often the only clue of its true height is a dusting of white when all peaks surrounding it are brown. 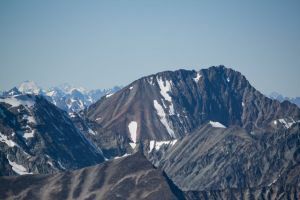 It is only when you go west of the Taseko River and begin to get into the Chilko Lake area that you begin to run into higher peaks, the most similar being Mt Tatlow.